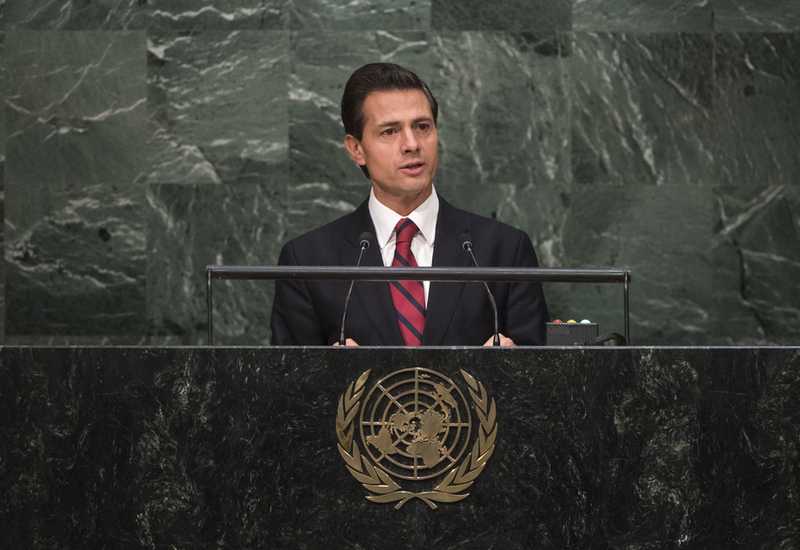 ENRIQUE PEÑA NIETO, President of Mexico, said that, since 1945, Mexico had maintained the highest level of commitment to the United Nations. Following the missile crisis, it had put its weight behind the Nuclear-Weapon-Free Zone Treaty for the prohibition of nuclear weapons in Latin America and Caribbean. It had celebrated the peace process in Colombia, as well as the reestablishment of diplomatic relations between Cuba and the United States. A member of the Human Rights Council for 2014-2016, Mexico had one of the most progressive sets of pro-human rights legislation. Noting that the twentieth century had suffered from individuals who had opted to divide populations, he cautioned societies to be on alert for those who took advantage of fears or concerns. Encouraged by recent major agreements, he said the United Nations was now advancing towards Security Council reform. Underscoring that the veto power must not be used for national ends, he supported France’s initiative to restrict the veto in cases of serious violations of international law and war crimes. Turning to the situation of migrants, he said movements of people in search of a better life was the norm in today’s world, however, in all continents, the migrant experience had been one of risks, discrimination, and abuse, made worse by ignorance, racism or pure political opportunism. “Let us not allow that injustice to continue,” he urged, adding that the world community must be united in its effort to create a global scheme to protect migrants’ rights. Millions of migrants required a global response — a response that should come from the United Nations. Humanity must also reassess its vision of the global drugs problem, which too required a more just and humane international response. During the Assembly’s special session next year, there must be a collective willingness to “reverse inertia” and develop people-centred policies. Keeping a watchful eye over the principles that gave birth to the United Nations was the responsibility of all, he said, urging Member States to work together to build a better future.